Religious leaders among dozens arrested in latest Ferguson protests. 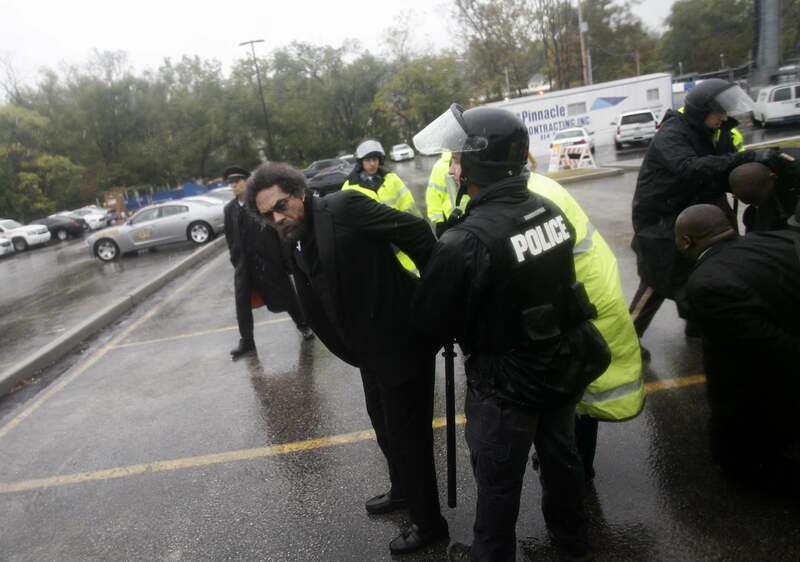 Cornel West is arrested by police during a protest outside the Ferguson Police Station on Monday. Hundreds of protesters assembled outside the Ferguson police headquarters on Monday, the latest in a series of protests over the fatal shooting of Michael Brown. “After a long standoff in heavy rain, 42 protesters who had offered themselves for arrest outside the police station were taken into custody about noon Monday – the first of several ‘Moral Monday’ demonstrations,” the St. Louis Post-Dispatch reports. Many of the protesters were religious leaders and “[s]everal clergy members approached individual officers and asked them to ‘repent’ for Brown’s killing and other acts of violence,” the Associated Press reports. Activist Professor Cornel West, took part in the demonstration and was arrested. “Though the mood was tense, the arrests were relatively calm as clergy members and others said they wished to meet with Ferguson police officers inside the building, then stepped forward after saying they were prepared to be arrested if they could not,” according to the New York Times. “Moral Monday,” as the activists called it, began Monday morning at Wellspring Church in Ferguson. The demonstrators walked two blocks to the police station in heavy rain as leaders with bullhorns read the names of people killed by police nationwide… At the police station, where about 40 police officers in riot gear formed a protective line between marchers and the police station, three activists drew a chalk outline of a man lying on the ground. March organizer Rev. Osagyefo Sekou called it “a memorial for the body of Michael Brown…” Clergy members then faced the police officers and demanded they confess their sins and repent… After the crowd knelt and prayed before the police, West and Sekou crossed the police line. Police handcuffed both men and put them in a police vehicle. A total of 42 people were arrested outside the Ferguson police station on charges of disturbing the peace. Monday’s protests were the culmination of four days of demonstrations in Ferguson. A grand jury is currently reviewing the Brown shooting and will determine whether Ferguson police officer Darren Wilson will face charges for the killing of the unarmed teenager.